Utilizamos traducción automática para todas las traducciones y las añadimos bajo el nombre de Miguel_TA. Sabemos que las traducciones no serán perfectas, pero esperamos mejorarnos con vuestra ayuda. Así que por favor, mandarnos vuestros comentarios y si domináis el español, decirnos si nuestras traducciones son comprensibles o no. Podéis indicar si una entrada se entiende o no votando a la izquierda de cada entrada como indicado en la imagen aquí abajo. Gracias por votar y de esa manera ayudarnos a mejorar nuestras traducciones. También podéis comentar o dar sugerencias sobre esta nueva sección en esta conversación. Vuestra opinión es muy importante para nosotros. ¡Gracias! The translations are all done by machine, and added with an account we call Miguel_TA. We know that the translations aren't going to be perfect, but with your feedback, we can make them much better. If you understand Spanish fluently, please review the solutions on the board and let us know if they are correct. When you view the post, you'll see a voting box to the left. Please help us improve the translations by voting. Additionally, please let us know all your questions and comments about the new board here in this thread. We want to know what you think about this project. Thanks! where there are two messages that the second one is a reply. With a longer thread this could get very difficult to follow in any language and I wonder if it would be possible to somehow include the links back to the original so for example one could look back and see either a clarification of a technical term or description of the operating system or the Norton Product where English might be better understood or even the normal language? Thank you for your feedback! In the Spanish MT board, all threads contain only the question and the solution of the original thread. You are right, a link to the original thread would be indeed helpful regardless of the length of the thread! We will implement this change in the next threads that will be posted. Thanks for the explanation which explains the "oddity" of the display! Now if the programmers want something really startling ..... work out how to put a link Jump to Spanish summary on the original message in the English Forums! Where's the 'me too' button when you really need it? Thanks for your suggestion! That sounds like a good idea but will - as you said - require a little more work. We will definitely consider it and see whether we can implement a link somewhere in or next to the original post. A) It isn't relevant without the multiple pages that go with it. B) It is only relevant to each separate computer. I hope you don't mind if I jump in here. Thank you very much for your feedback! Your suggestion makes a lot of sense. Could you maybe give an example of a thread with the characteristics mentioned? Are those threads marked in any way, with tags for example? We are identifying the threads and posts to be translated automatically, so tags or something similar would help us a great deal. First off, I have to say I do not speak Spanish, so I hope the following examples explain where I am coming from. One tag I have noticed is 'threat'. Thanks again for your observations; they are very helpful! We will investigate whether we are able to filter out those kind of messages. I'll post again once we have results on this. Maybe a sticky telling people that if they spot a message/thread dealing with removing a trojan not to add to it but to post a new message asking for help? And explaining why .... ? Thanks Krusty and Huwyngrr for the great suggestions! We have reviewed the possibilitieswith Linda and the team and given how these posts are translated and posted and although your points are completely valid, it isn't feasible for use to pinpoint these types of posts specifically without doing it manually, which isn't scalabale. One solution we discussed was to leverage tags as we could easily pull out the associated posts but as they are not tagged in a consistent fashion, this wouldn't have the desired effect. If we tried to pull them by the content they contain, the number of false positives would mean a lot of valuable solutions would not be available to our Spanish speaking users. The typical behavour for users of this section is to come into a specific post via a Google search on the subject and then deciding wether it is applicable to their issue. Users are not browsing this section as it behaves closer to a KB (since most of the discussion is stripped, leaving (hopefully) a question and a solution. To the suggestion of some general guidance that is viewable in all threads in this specific section, i think that is a great idea and we are open to anything that improves the user experience or prevents confusion. We will look at how something like that may be incorporated effectively. a sticky is an excellent idea! We're working on it. Is the Spanish Forum here only for translations of posts or can Spanish language users be pointed to it to post? We had one the other day where I used google to translate (quite well) and tried to answer in Englsh but I've not seen the OP again. I thought was the situation but just wanted to make sure. To contact customer support Click on this link https://www.norton.com/chat and work on from there. once they say where they are? 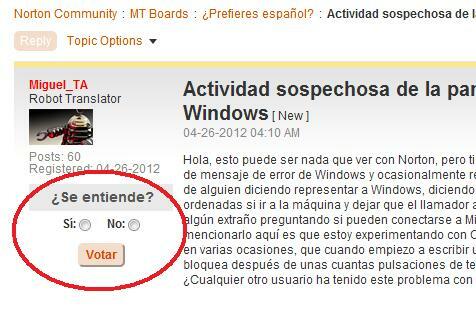 Yes you're absolutely right, once they specify the language, they get redirected to the Spanish chat support page.